Social decision-making is the lean process of making use of information in a social context to gain insight, early buy-in and accountable commitment. The holistic methodology captures the entire lifecycle of a decision from the triggering question to collaborating for the best solution, execution and evaluation. Crowdsourcing input from all stakeholders results in better addressing all potential concerns. A co-operative, collaborative group atmosphere fosters greater group cohesion and interpersonal connection. The transparent lifecycle of decision-making enables learning by detecting unintended consequences, errors in understanding, information or process or in underlying premises. 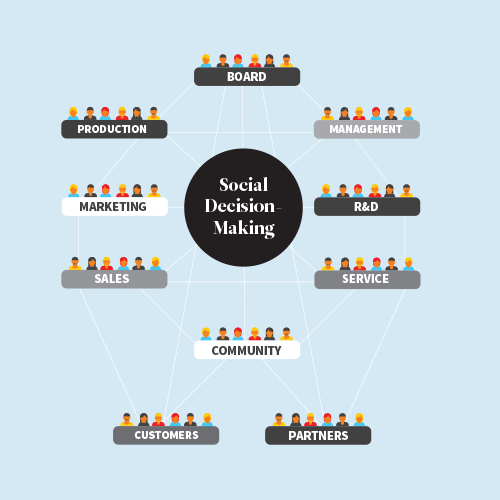 Social decision-making produces a better quality decision process that includes and respects all parties, and generates as much agreement as possible setting the stage for greater co-operation in implementing the resulting decisions and leading to better outcomes. Social decision-making helps build a more productive and meaningful workplace. Our answer is Social Decision-Making. Over the past decades decision-making has evolved and gone through many phases. Fingertip is bringing the next evolution of decision-making, which enables organizations to tap deeper into one of their most valuable assets, their people! It is all about collaboration, accountability, and commitment. Good decisions are not made in isolation. They require shared knowledge and analysis of data, different pieces of information, points of view and expertise. Good decisions require collaboration. Invite the skills and knowledge needed, invite the people whose ideas and opinions are relevant for the issue at hand, just a few colleagues or crowdsource your whole organization. Sharing ideas, comments, knowledge and information, interacting and listening to one another, also to the critical data is the prerequisite for collaboration. Social decision-making requires trust and the capability of dialogue. At the same time crowdsourcing allows huge amounts of information to be processed by the experience of the participants. Fingertip allows you to create ideas, solve problems, propose solutions, make timely decisions, execute those decisions, and most importantly, analyze the impact of those decisions for future learning purposes. All this is accomplished by sharing information and ensuring its flow by assigning decision-making accountability to competent people. The use of defined roles; responsible, accountable, consulted and informed support the process and make sure every individual is aware of what is expected them. Understanding the expected results allows employee the opportunity to succeed, reinforces commitment and in the long run helps to better the decision-making process. Social decision-making increases buy-in and accountability of the stakeholders, enforces empowerment and organizational learning, it takes into account the human aspects of emotions and is significantly faster because of parallel and real-time processing. Social decision-making leads to organizational productivity and wellbeing. 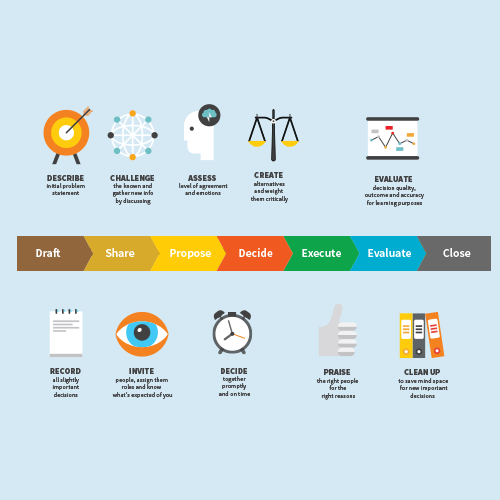 Decision-making is not only about the action of making a decision, but rather the entire process; Draft, Share, Propose & Decide, Execute, Evaluate, Close. From describing the decision all the way to closing it, all that is relevant is included in the lifecycle. The lifecycle of a decision is the basis for better decision-making quality.